Weekend back-road trip through Western Indiana and Eastern Illinois. All of the images were taken with a Polaroid SX-70 Sonar camera using expired FadetoBlack film. This limited edition film requires manipulation within minutes after developing or the image will ‘fade 2 black’ (hence the name). The longer one waits to manipulate the photo, the darker it will get – turning completely black in well under 24 hours. I manipulated the images below about 3-5 minutes after development. I found this film to be a perfect choice for capturing the decaying beauty of these historic barns. 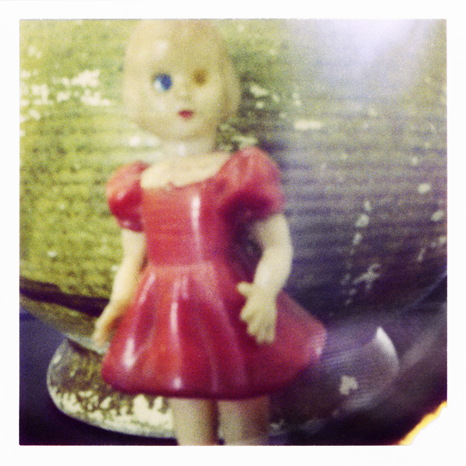 …’plastic dolls’ series using a Lomo Lubitel pinhole converted camera. After months of procrastination, I have successfully converted my Lomo Lubitel 166 into one gem of a pinhole camera. My original plan was to keep the conversion simple by doing nothing more than removing the plastic lens and replacing it with pinhole shim. After completing this task without difficulty, the only thing left to do was buy some 120 film and a shutter release cable. With that, I set my newly altered Lubitel aside and ordered my supplies online, eagerly awaiting their arrival. With 120 film and a cable release in hand, I put them on the shelf right next to the Lubitel pinhole; and there they sat…days turning into weeks, weeks into months…you get the picture. At any rate, dust began to collect, as it was months before I picked up where I left off. By this time I had collected a few vintage Polaroid cameras and had the idea to remove a film back from one of them and slap (or heavily duct tape) it to the back of the Lubitel. So once again, the conversion continued as I set up shop and busted out my Dremel, dedicating several, non-stop hours to cutting, buffing and taping plastic to plastic. In the end, a rather nice looking (duct tape included) pinhole camera emerged. Due to the smaller size of the Lubitel camera, I decided to go with the Polaroid back that takes Type 80, square format pack film. Plus, I still had a pack of Viva laying around, with more on it’s way (from Ebay). I recently bought a vintage Tektronix C-30A close-up camera from Ebay. This particular model comes with a Polaroid film back attached – which of course, is the main reason I bought the camera. I’d like to share my first couple of shots that were taken using (expired) Polaroid Viva Color film. Open to any comments or questions!